This has been an incredible year for mangoes on Maui. Everywhere I look this summer, I see enormous mango trees laden with golden orange and red orbs of fruit. While we ourselves do not have a mango tree, we have been fortunate to be the recipients of many of our friends’ and neighbors’ excess yields of the season. It is hard to outdo the taste of fresh mango. Nothing exemplifies the exotic nature of Hawai’i quite like it. With this season’s bounty we’ve enjoyed mango smoothies, mango lassis, mango pie, mango and sticky rice, mango in rice, mango and tofu, mango for breakfast, mango for lunch, mango for dinner …. you get the idea. I marinated tofu for several hours and basted some veggies from our garden to make kabobs that we grilled for dinner – they were delicious. I, like Ben Stiller in “There’s Something About Mary”, love food on a stick … just make mine vegan. Something about food on a stick just says summer time. The marinade would probably work as well on seitan or tempeh and on any veggie of your choice. It’s also quite adaptable – by adjusting the curry or adding more chili garlic sauce (or chipotle … or Tabasco…) you can make your kabobs as spicy as you’d like. Enjoy the experiment! I used this marinade on tofu that I drained and pressed. I marinated the tofu for several hours before grilling it. 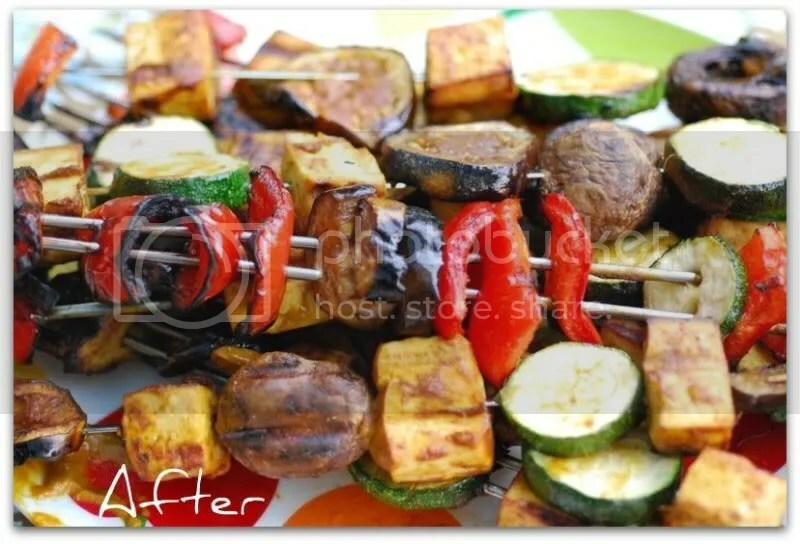 I then basted the marinade on zucchini, red pepper, mushrooms, and Japanese eggplant just before grilling. 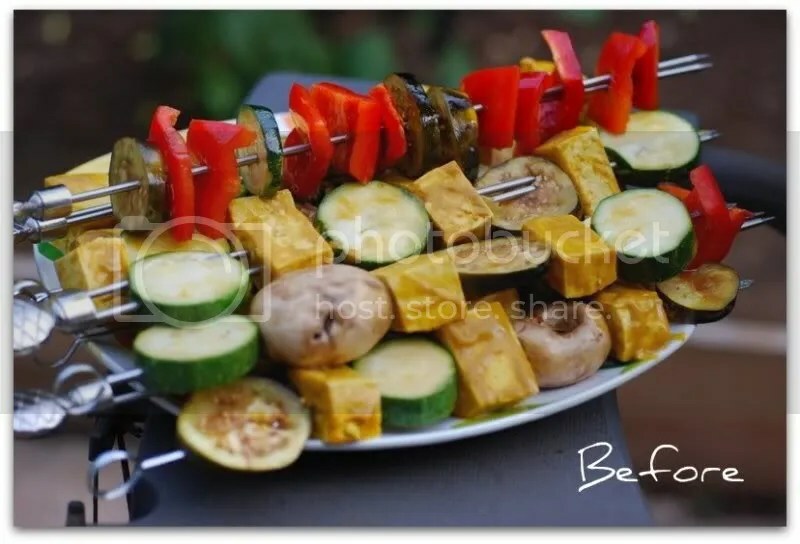 Be sure to grill the kabobs evenly on each side and baste your kabobs with any extra marinade when you turn them during grilling. 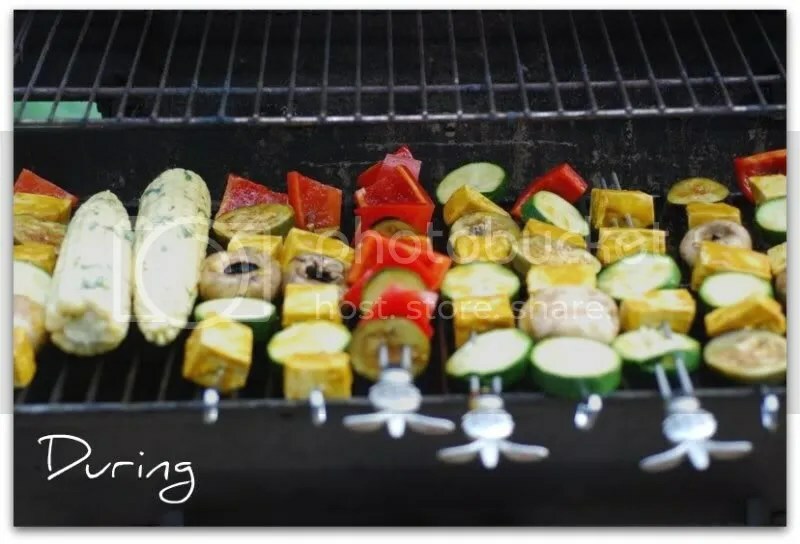 Be sure to spray your grill liberally with non-stick cooking spray before putting your kabobs o the Barbie or else you’ll be tempting grilling fate and will very likely end up with the remnants of kabobs clinging to the grill. i would have never thought to grill mango! these look beautiful and really awesome! I’m coming over for dinner, okay? Mmmm I love kabobs. I also love your blog! Two of my favorite things, on stick?! What’s not to love! Oh how I wish I had mangos on hand like that! Beautiful! Everyone’s invited for the next barbecue! Delicious – mango marinade is a winner for me.